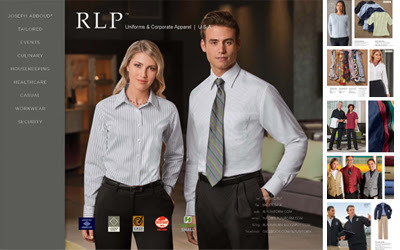 154 pages of products that will keep your employees looking their best in clothes they will want to wear. Everything from finely tailored suits to casino clothing, server apparel and workwear. Featuring styles from Joseph Abboud, Linden Grey, Red Kap, Chef Designs & Horace Small. We are very happy to announce a brand new 'made to order' custom uniform program with minimums as low as 12 pieces. Choose from a wide array of styles in suiting, hospitality, server, bellman and casino in a variety of fabric options including a Washable 100% Polyester with Mechanical Stretch on many styles. The patterns are already made and the fabric is in-house, all you have to do choose styles and fabrics from the catalog and your garments will be made and shipped in 2-6 weeks. Made in U.S.A. production on smaller orders.